Hooooooooooooooooooooo. Such a long day! Working on Saturdays is definitely not an easy thing. Unfortunately, I had cos of my current projects. Anyway, I missed this year’s Gorgeous Festival while many people enjoyed themselves. The even worse thing was that my wife replaced our normal yogurt for butter chicken with a Greek style yogurt, which completely ruined this lovely Indian dish! 😦 However, one can’t always be bad luck. I found my new favorite super juice and it was sooooooo good. The juice was out in the market since 2008. Created by Vitality Brand in Victoria, the juice received numerous media access and reviews. It is not our daily normal juice. 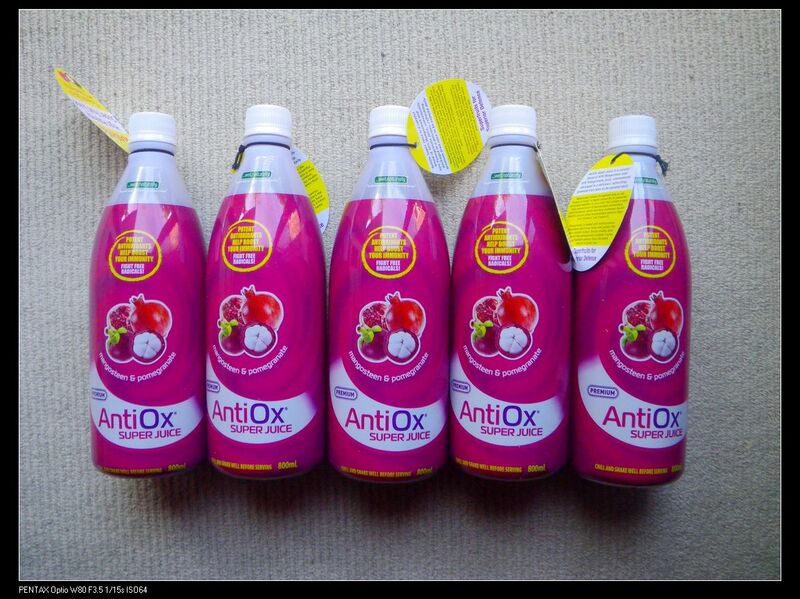 It contains Mangosteen and Pomegranate which are valued for their anti-oxidant activities in Asia and help to protect our immune system by fighting against free radicals in our body. The company claimed that their super juice was great carefully blended with only the juices from this two fruits and do not contain any “cheap” apple and pear juice. Mangosteen, referred as the Queen Fruit in Asia, contains Xanthones, which have many health benefits while pomegranate, has high potency of antioxidants and polyphenols and yet the same amount as in green tea. Although the health benefits are important to human body, I care more about the taste. To be honest, it isn’t that great by direct consumption. 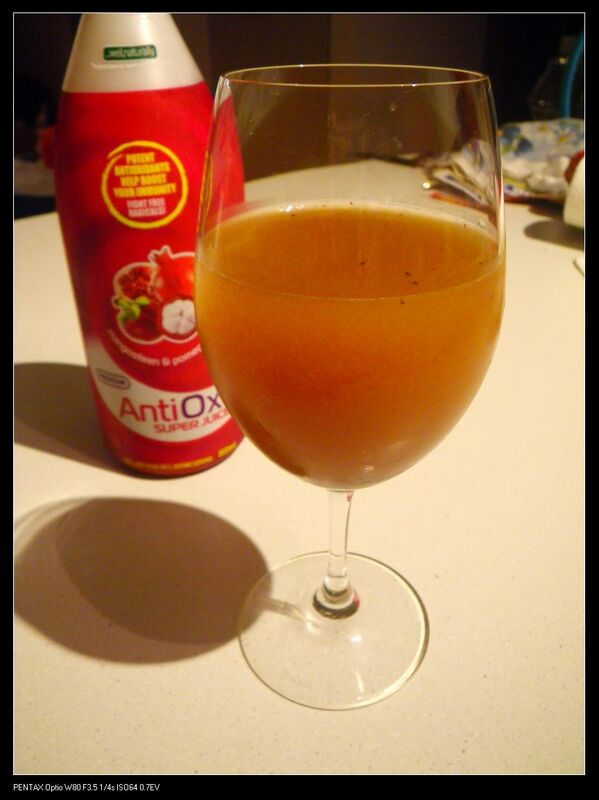 It is a highly concentrated super fruit juice. Then, it is super super super sweet and my readers know that I am not a sweet kinda person. Anyway, a super sweet juice is my first and direct image to the product. I then started worrying about how I would finish all these juices then and came up two great idea. Consume a small amount every day by direct consumption. This will ensure my daily intake of antioxidants and help my body to survive after working with polyphenolic compounds whole day in my lab. Crap! Isn’t it? I reckon this is a better one. I mixed 1/3 of the chilled super juice with 2/3 chilled Mt Franklin slightly sparkling water. Guess what? It tastes brilliant now. After being diluted, I can actually detect all the flavours from the two fruits. The sparkling mixer has actually enhanced the taste. You may wonder if it tastes like soft drink then?! Definitely not! It still has its own distinctive structure, texture and flavour while being bubbling in the mouth gives a calm feeling. I am totally in love with this juice now. It does not only help to improve our immune system but also has a great taste after being diluted. I would recommend them to all my readers. The juice is available in health food stores throughout Australia at $17.50 per bottle. I’ve included the ingredients and dietary info from a web store aussiehealthproducts.com.au. 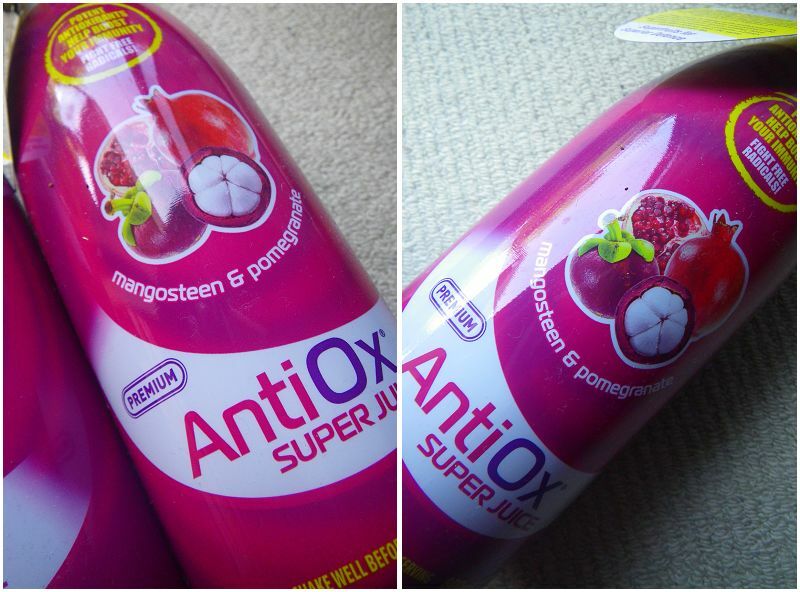 Ingredients: Mangosteen whole fruit juice (40%), Pomegranate juice (30%) from concentrate, Red Pitaya (Dragon Fruit) juice, Passionfruit juice, potassium sorbate preservative (0.02%). Scoopon had a deal for it several wks ago. 6 for 29. I was wondering if I should get some but missed out. Hopefully they will have another one like this cos there has not be a decent deal for a long time. I had the juice for 3 years and honestly, it’s the best among all the commercially available super juices. They are very good, aren’t they? Better than some higher priced ones I think.